Last month, we decided to go see Palouse Falls. We had heard that the hike was easy, so we took the kids and my mom with us and headed out. Spring is the time to go. 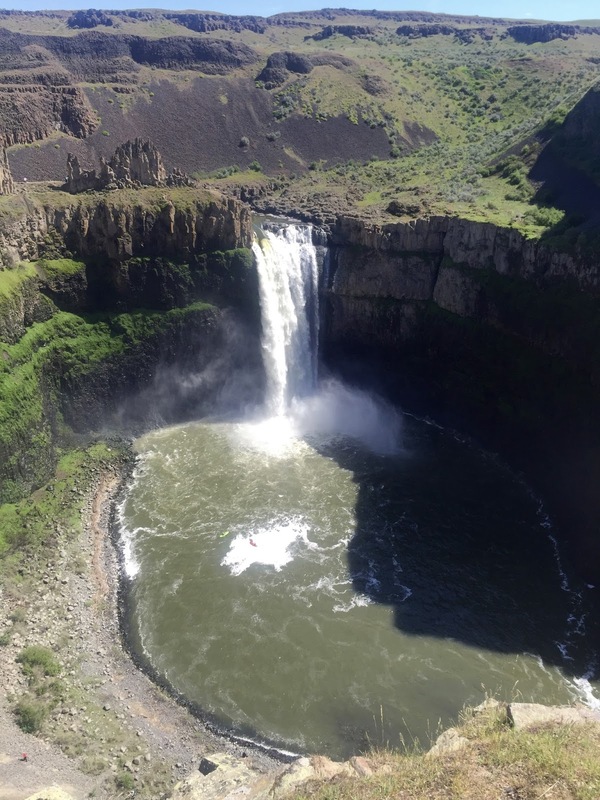 That's when Palouse Falls is rushing and most impressive due to the run off from the snow melting in the mountains. It's really breathtaking. The Palouse is so dry, there are no trees anywhere; nothing apart from rolling hills and fields. You drive for hours out into the middle of nowhere and there it is! So huge, so dramatic. So truly incredible. Do you see the tiny kayakers and the itty-bitty hiker in the photo? Unreal. The hike is not easy. It is not for children. It is not for senior citizens. It is not for anyone. No sooner had we arrived than we saw a woman down on the trail below with a broken leg. The volunteer called out to her that help was on its way as we went past, presumably toward the trail, but nothing was marked. We really wanted to get around and see the river that runs into the falls, so we decided to go ahead. To get as far as the two photos immediately above, we had to do some pretty hairy hiking past "Continue at your own risk" signs and over what is essentially a big, gnarly rock slide. Once we were there, we had to stand out of the way while the helicopter came in to air lift the woman with the broken leg out. She looked to be in her early 20s. I imagine she will be paying those medical bills for the rest of her life as the signs clearly stated individuals are financially responsible for any rescue costs. Yikes. The river is impressive and beautiful, but getting there was starting to seem like a really bad idea. By the time we'd scrambled over more rocks and reached the tiny six inch wide "trail" (really more of a death path) that encircles the bowl, we decided it wasn't safe to go any farther. So we headed back at that point. It was all quite confusing. No marked trails. No trails at all. It's such a popular place and so remarkable and celebrated. And yet, it's not developed or safe in the least. Once we were back home and did a little reading up on it, we realized that the state has been trying to bar access and keep people out of there for quite some time. It's sad because Palouse Falls is an amazing treasure. If you go, just pack a picnic and stay at the observation area by the parking lot. It would be awesome if some money were put into developing and maintaining a trail, but it's worth it to go just to see it, minus the hike.